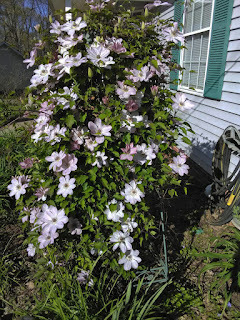 Some of the most beautiful plants in my yard are the Clematis vines. I have several different ones in various locations around our home. 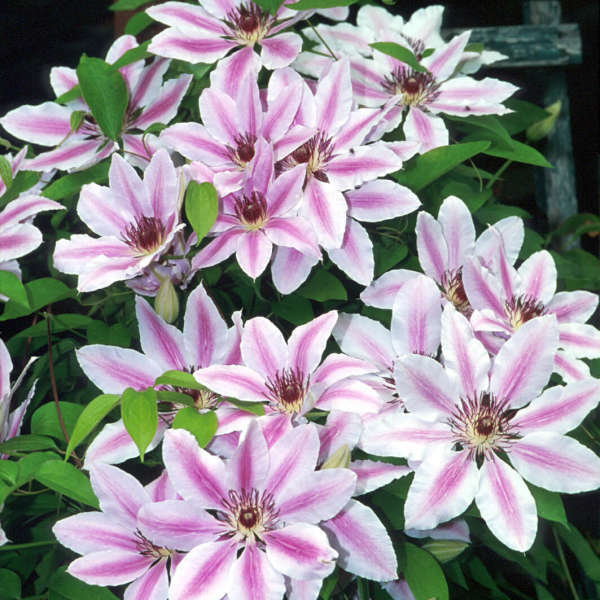 Because of the varieties I have planted, I have blooms from early March all the way into late June and sometimes a few of them will rebloom in the fall. I have moved several of them with me more than once. 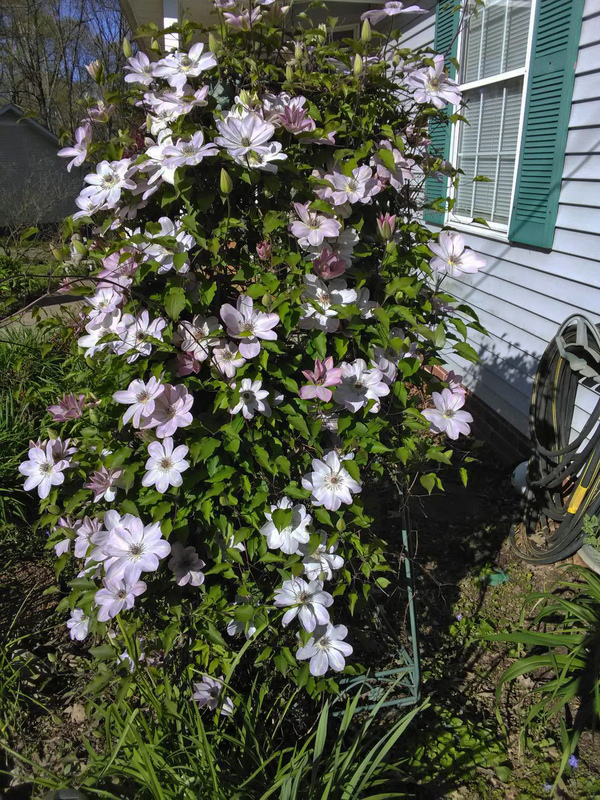 My "Dawn" Clematis has been moved three times and still is the biggest showoff in my yard. 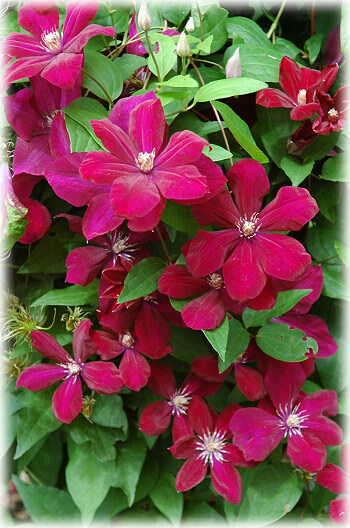 It starts blooming in early March and has just finished in mid-May. The seed pods are nearly as interesting as the flowers too. They create winter interest when everything else is dormant. 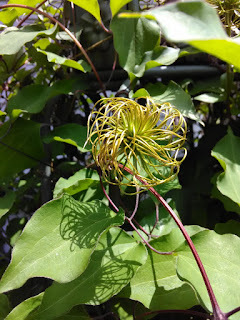 Clematis vines like their heads in the sun and their feet in the shade. To accomplish this I mulch them well and often underplant them with a low growing perennial. Nowhere in my yard is there full sun and mine Clematis do great in simi-shade. Many people cut the vines back to about 2 feet tall in late fall. This can force new growth in the spring. I rarely do that because I'm normally so tired by that time of year that all I want to do is sit on the swing. My vines grow as much as I need without pruning. The one in the Dawn in the picture above is growing on a big wrought Iron contraption that I repurposed for the garden. Bill came up with a great idea for growing Clematis on our privacy fence: He nailed wire fencing to the fence posts. He turned the fencing sideways and the gap created by the fence posts allows the vines to weave through the support. Propagating Clematis is fairly simple. One easy way is to cover a vine with soil (vine still attached to the plant), leave it alone for about a year and it will root. After it has a nice little root system, cut it loose from the mother vine and plant it. 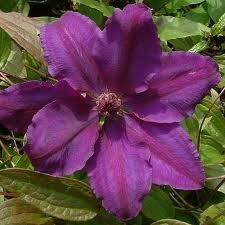 Clematis can be propagated via stem cutting also. Cut a section of vine, make your cutting at a leaf node and leave one leaf joint above that cut. I trim the leaves on the top of the cutting in half. Dip the cutting in a rooting hormone, stick it in moist sand and leave it in a shady place. It may take a couple of months to root. When a slight tug results in resistance, gently lift the stem to see if you have roots. I'd probably pot the new babies in gallon pots and keep them in the shade until they are well established before planting in the ground. 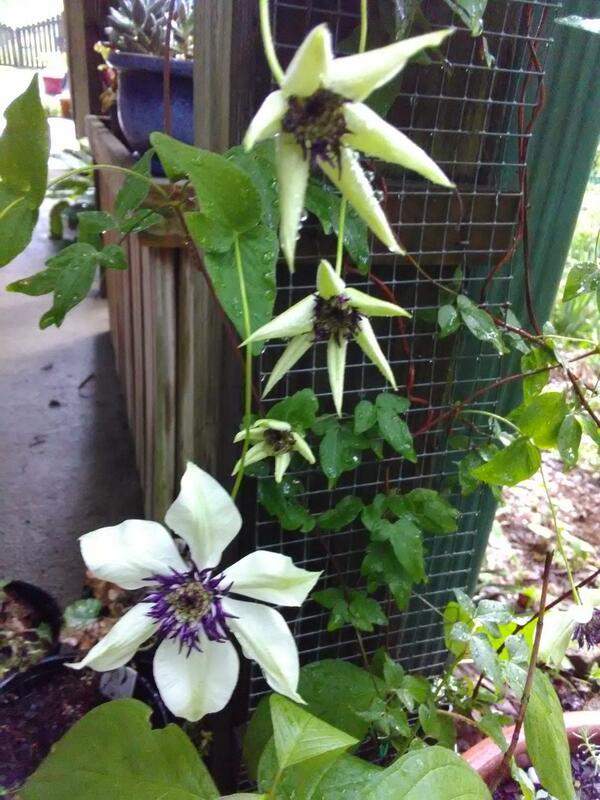 Below are a few other Clematis vines that are growing in my backyard.